Students frequently ask me what foods are typically consumed for breakfast in the Orient. Unlike here, where there are specific foods identified with the morning meal, the distinction between what is eaten at breakfast, lunch or dinner is not as clear. Often, breakfast is a mini-version of lunch or dinner, and among farmers and laborers, it is just as substantial as any other meal of the day. When I was growing up, leftovers from the evening before plus one or two simple, newly cooked dishes served with rice made a satisfying morning meal before the family headed off for school and office. Breakfast may also be any of a wide range of noodle soups, stir-fried noodles, curry over rice, fried rice and other savory one-dish concoctions. On the cultural tours I lead to Thailand every winter, I delight in the endless choices available for breakfast at fast-food rice and noodle shops that do a bustling business in the early light of the morning. One of my favorite breakfasts is spicy basil chicken over rice topped with a crisped fried egg. The same makes just as gratifying a one-dish lunch. But if I had to name just one food most closely associated with breakfast, the most likely candidate would probably be rice congee. The soupy rice mixture is made either plain and served with a variety of salty, pickled and stir-fried dishes; or chicken, pork, fish or shrimp can be cooked in with the soup and flavored with garlic, ginger, scallions and cilantro. To make congee, rice is boiled in lots of water or broth until the grains have grown many times their size and are still swimming in excess fluid. The grains may also be cooked down until they completely disintegrate and become the texture of creamy rice cereal. Made either way, congee is very nutritious and highly recommended for people suffering from fatigue, digestive problems and illness. It is easy to digest and contains nutrients in ready form to be absorbed and used, thereby enabling quick revitalization of the body. What better way to "break" the "fast" of the night and begin a new day of productive activity than to partake of a vitalizing bowl of steaming rice soup! The rice can be cooked either by boiling directly in the pork broth; or separately, as the recipe instructs, adding the broth to it just before serving. The latter makes a lighter and clearer soup. Rice cooked directly in the broth will thicken the soup and eventually congeal into a dense mass. But if the texture of creamy rice cereal is what you are after, then boil the rice in the broth. Frequently, leftover rice is used to make congee, but the resulting soup will not be as tasty, because the starch in previously cooked rice has hardened and will not flavor the soup as well. In the recipe, the separately cooked rice is boiled with sufficient water to break down the starch in the grains, so that when added to the hot broth, the flavor of the rice melts into it, the soft-textured grains blending in with the soup. Instead of pork, you may also use chicken or seafood such as fish and shrimp. Try a version with turkey – make the soup stock with the carcass from your Thanksgiving bird, adding shredded pieces of leftover turkey to warm through before serving. If you are accustomed to having toast and coffee for breakfast and cannot bare to face a piece of fish, pork or turkey for breakfast, serve the congee for lunch, dinner or late-night snack on those cold evenings when a steaming bowl of soup is comforting. But because congee digests easily, containing only a very small amount of rice compared to a serving of regularly cooked rice, serve yourself a large bowl, or go for seconds and thirds. 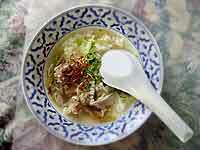 Continue on to Rice Congee recipe. Copyright © 1996 Kasma Loha-unchit. All rights reserved.